Fajitas are all about the seasoning so I just play around until the marinade tastes good to me. But, the truth is, it is the vegan sour cream that makes it extra special! Mix all the ingredients of the marinade. Season. Taste. Adjust. Slice the tempeh the short way and coat with the marinade. Let sit while prepping the vegetables. Slice the onions and peppers, about the same size, and saute in safflower oil, starting with the onions and adding the peppers when the onions are translucent. Season with salt and pepper. In a separate skillet, cook the tempeh, pouring it all in plus the excess marinade. Let it cook until one side is well done and then flip each piece. The rest of the marinade will carmelize and taste really good. Slice up the avocado and lime. Heat up the tortillas. Set it up so that you have all of the ingredients to make the fajitas: vegetables, tempeh, sour cream, avocado, and limes. 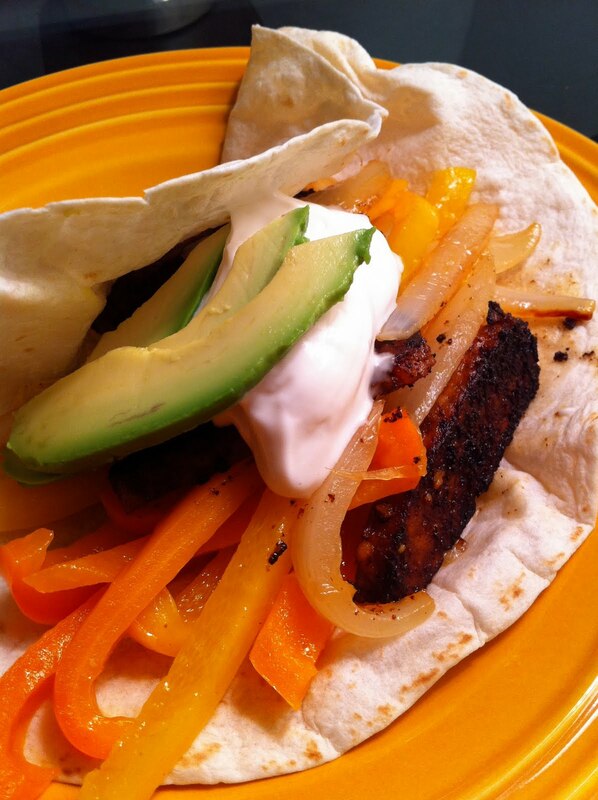 Place the tortilla on the plate, pile on the vegetables and tempeh. Top with sour cream and avocado. Squeeze a little extra lime juice over the top. Enjoy!